Extruded fibreC comes in 3 products: concrete skin, öko skin and formparts. All products are authentic materials in line with the current trend towards natural, environmentally-friendly, sustainable and cost-efficient materials that achieve an aesthetically appealing and modern effect. 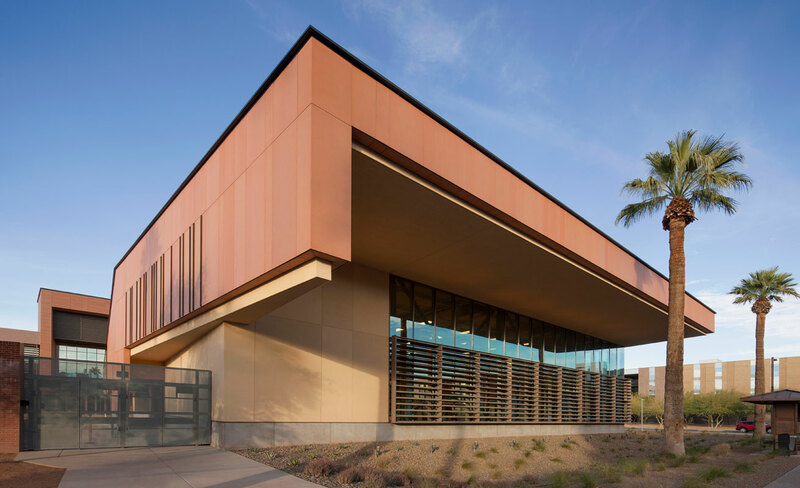 These rain screen façade panels exist to cover buildings like a skin made of concrete – opening entirely new possibilities for modern ventilated wall design with long-term durability. Panels are 100% non-combustible and are dyed throughout with natural colour pigments and are available in 12 different colours with three surface textures (Ferro, Ferro Light and Matt); panels are available in sizes up to 1.2mtrs x 3.6mtrs. Arizona State University. Architect: Studio MA. Photography: Bill Kimmerman. University of Utah South Jordan Health Centre. Architect: Dixon & Associates. Photographer: Sohm. Helios - University of California. Architect: Smith Group. Photography: Daniel Lunghi. Elementary Teacher's Federation of Ontario. Architect: KPMB. Photography: Marius Mezulis. Blue Water Bridge Canadian Plaza. Architect: NORR Ltd.
Nelson Mandela Park Public School. Architect: CS & P.
University of Waterloo - Engineering. Architect: Perkins & Will Architects.